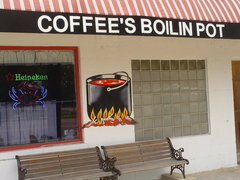 Chef Robert Irvine visits Coffee's Boiling Point in Madisonville, Louisiana, where he meets owners Tim and Allene who fell in love when they worked in the restaurant. They got married and when the business was up for sale in 2005 they bought the business. Things went downhill after they bought it and because of the pressure of running they restaurant they fell out of love and soon divorced. Three years later, they are barely speaking to each other and the restaurant is in trouble. Robert finds that the restaurant is dirty and that the food is frozen, poorly cooked, greasy and has no flavour or seasoning. In order to relaunch the restaurant, Robert revamped the menu and dining room, gave the kitchen a deep clean and acted as counsellor for Tim and Allene to help resolve their issues. The restaurant closed in July 2012 and reviews were mixed prior to their closure. The restaurant was ravaged by Hurricane Isaac after being sold in August 2012. Another seafood restaurant named Crabby Shack was opened in it's space in February 2013 following a vast revamp. This episode was episode 14 of season 2 and was aired on November 16 2011, there were 18 episodes in season 2 aired between July 2011 and January 2012 and the closure rate for Restaurant Impossible Season 2 currently stands at 67%.